From sheep station to wool store a horse and wagon ford a stream getting a clip from the back country into the store. The Waimakariri river breaks its banks again over the main road : a service car negotiates the flooded road. 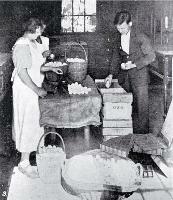 Poultry raising and egg production in Canterbury : stamping, weighing and packing eggs at Fazackerley's poultry farm, Sockburn, Christchurch.